Midnyte Reader: The Walls Around Us. Title/Author: The Walls Around Us by Nova Ren Suma. Synopsis: On the outside, there's Violet, an eighteen-year-old dancer days away from the life of her dreams when something threatens to expose the shocking truth of her achievement. Midnyte Musings: Sometimes a book comes along that makes you so grateful that you found it. So happy to be a reader. So appreciative of the written word. The Walls Around Us is one of those books for me. It is a gem. A YA that is part contemporary, part mystery, part supernatural and all combined beautifully. The story and the writing is haunting and lovely and the characters are compelling. The story is a puzzle and I loved figuring it out. Although I saw a main plot point coming, I wasn't sure how I was going to get there and what the final outcome of it would be. This book was so intriguing I read it in a matter of days. There is nothing rushed in this book and every phrase is purposeful and important. Sometimes I had to re-read passages and paragraphs because I knew there was hidden meaning to be found and I didn't want to miss it. It was like looking into a cloudy pool of water waiting for it to clear. Although this was told in three different pov's, it was not confusing at all and I needed all three of the main characters, Violet, Amber and Orianna, to tell the story so it made sense. The way their paths intertwine reminds me a of a drawing starting in different places. It isn't till the end of the story (when the drawing is finished) that you get to see the whole picture. I loved getting to know them and their motivation. I was intrigued and looking into their psyches and souls was thrilling. There is so much meaning in each chapter and even seemingly unrelated occurrences come into play later. I loved that the supernatural elements of this story were not in your face, but more a subtle and gentle push that makes you question what is reality and what is not. 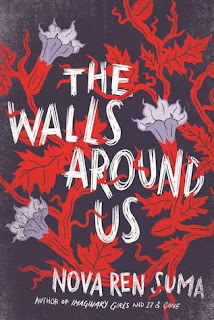 The emotion and events in this story are deep, dark and troubling yet if you are squeamish or don't usually like dark fiction, The Walls Around Us is handled in such a way that the darkness is beautiful. SPOILER: The only issue I had is that I wished there were just a few more hints to Violet's personality. But maybe that is the author's intention of a big reveal. This is a book that made me say "Wow!" Beautifully written, mysterious. Labels: Nova Ren Suma. YA. Beautiful review Pam! I love that feeling when I finish a good book. There's nothing like it!